Job Site / Storage Containers - Easy Haul, Inc.
Our jobsite ground level storage containers are safe and solid. Customers are charged on a per month rental basis along with a one time delivery and pickup charge. There are no fuel surcharges or other hidden fees. If a container is to be used less than 30 days, a reasonable daily rental rate can be arranged. Billing accounts can established upon completion of our short Credit Application. Instant storage for any purpose. 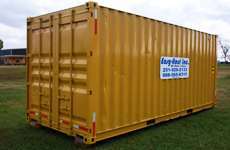 Portable Storage containers are constructed of heavy metal offering safe and dry storage. Air vents help prevent excess moisture. While reasonable effort is made to insure containers do not leak, we cannot be responsible for items stored in our containers.